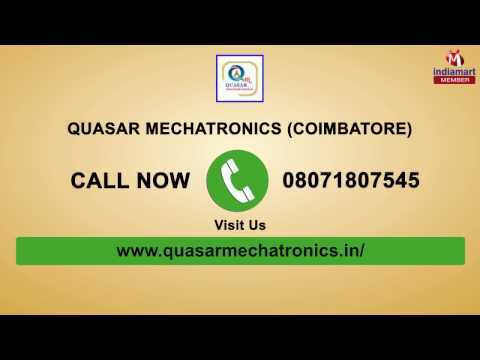 Established in the year 2012, Quasar Mechatronics is recognized amongst the affluent manufacturer, exporter, importer and trader of a comprehensive assortment of Industrial Automation Components & Solutions. Our product range includes Control Panel, Servo Motor and CNC Controller which are known for their excellent performance, robust construction, easy installation, elevated durability, high efficiency and longer service life. Our Scope of work starts from a study of application followed by Conceptual design, Development of a prototype, testing, documentation, and training. Our Sound Engineering design base assists you in optimum design of structures, mechanisms, and selection of related automation components. We act as a System Integrators providing solutions in various brands of PLC%u2019s, VFD%u2019s, Servo/Stepper Motor and drives, HMI & SCADA applications. Our Reverse Engineering Services and Mechanical Design Services are provided by a team of experts. Moreover, our ethical business practices blended with customer centric approach has provided us huge clientele base. Our vision is to be recognized as one of Global Leader in providing Industrial Automation Solutions. We also deals in following Brands MK, Adtech, Selec and Siemens, etc.